Della’s Diamonds! A New Lindy J Quilts Pattern Now Available! We are so excited to add Della’s Diamonds Quilt Pattern to our collection! Della’s Diamonds Quilt Pattern is named after my grandmother’s sister Della. Della too came from a long line of quilters and sewers and we wanted to honor her quilting legacy with this fun, modern quilt pattern. Have you ever worked with HRT’s (Half Rectangle Triangles)? Well, they are so fun to work with and they create really cool quilt designs. For this quilt pattern, we opted to lay our HRT’s out to create a diamond design, but it wasn’t as easy as we thought it’d be! So we created a quilt pattern that will save you some time and cutting. 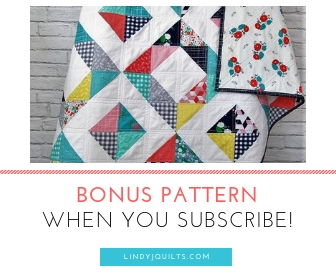 Our Della’s Diamonds Quilt Pattern will also show you how to sew Half Rectangle Triangles in such a way that creates this amazing diamond pattern. For our feature baby quilt and throw pillow, we used the amazing fat quarter collection of Karen Lewis’s Low Volume Blueberry Park collection and off-set the beautifully subtle prints with Robert Kaufman’s Essex Linen in Shale. The Linen has a wonderful texture and is so much fun to work with! But those prints! We can’t get enough of Blueberry Park. You will probably find some Blueberry Park in most of the quilts we create. The prints are fun, whimsical, modern, and beautiful. The colors are perfect hues of blues, pinks, yellows, purples, oranges, grays, and blacks. We used Art Gallery’s Squared Elements in turquoise for the quilt back. If you haven’t worked with Art Gallery Fabrics, you definitely should! Art Gallery fabrics are stylish, artistic, and wonderful to the touch. The Squared Elements complimented these diamonds perfectly and kept the quilt light-weight. We cut our binding on the bias and used Dress Stripes in Red. The red really makes this quilt top pop! And bias-binding gives the quilt added strength. This quilt will last for years! But the quilting is what made all the difference to this quilt. We stitched in the ditches and then ¼” on each side. We then added additional 3 lines of quilting in the middle of the half rectangle triangles to give the diamonds added depth and dimension. Diamonds within diamonds! Our Della’s Diamonds Baby Quilt and Matching Throw Pillow are available for sale in our shop. They are perfect for a modern baby girl nursery. The Della Diamonds Quilt Pattern is a little more challenging to create, but if you have a little quilting experience you can definitely handle it. Our Della Diamonds Quilt Pattern has fabric requirements for quilt sizes ranging from mini to queen-sized. The quilt pattern has detailed cutting and sewing instructions as well. You will need this awesome Quilt in a Day Half Rectangle Triangle tool to help you cut the perfect half rectangle. The Della’s Diamonds Quilt Pattern will show you how to use it. And if you get the ruler, you will need these non-slip grips. They help keep your ruler from sliding around – trust us, you don’t want that happening! Thanks for stopping by and seeing what we’ve been creating. We have a few more HRT projects up our sleeves, so stay tuned!